How do I print a circular part? Just received my M3-ID Dec 23rd. It has been running PLA nonstop since I got it. I purchased it because I could run the parts I sell at twice the speed using the duplication mode. This is my second printer, my first being a seemecnc rostock max V1. I have many hours on it, but it has it's issues and being a kit I figured if I bought a prebuilt printer I would have better luck with printing multiple parts. I have the stock .35 nozzle, tried .2 layers, .25 layers, default speeds, 30mms, wipe, no wipe, 1 to 5mm retract, 0 to -1 extra on restart, 220 to 245C with makergear, IC3d ABS, no retract, coast, no coast.... I can't figure it out... Only using S3D. Have not tried any other slicer as I am not sure what will work with the ID without having to input settings. Funny part is I could never get the rostock to print PLA, now I cannot get the ID to print ABS, I have built an enclosure, it is half assed but keeps the heat in and the breezes out. My part is 4 inches tall with a 2mm wall, .55o diameter. Tried a bunch of different thinwall settings. I have resorted back to using the rostock printing one part at a time..... mainly because the heated bed on the rostock is so warped it is hard to print more than one part at a time on it, and instead of spending the money to upgrade it I figured I would just get a new ID. If I could get nice parts with a positive z scar or vertical line I would be O...K.. with that. I could always sand or file them down and then ship them. But I am getting what looks like under extrusion or missing filament at the end of my layers with no coast and no extra on restart. Or with coast and extra on restart. Is there some way to make the nozzle extrude past the start so the layers run into each other? Or past each other? Both printers are using the same STL file, different slicers, right now I am a little worried I spent the money on the ID when I cannot get any better circular prints than with my 10 year old kit built delta printer that I have beat on for many, many hours.... I do not print trinkets, I only print parts that I sell, and they are all made from abs. Re: How do I print a circular part? 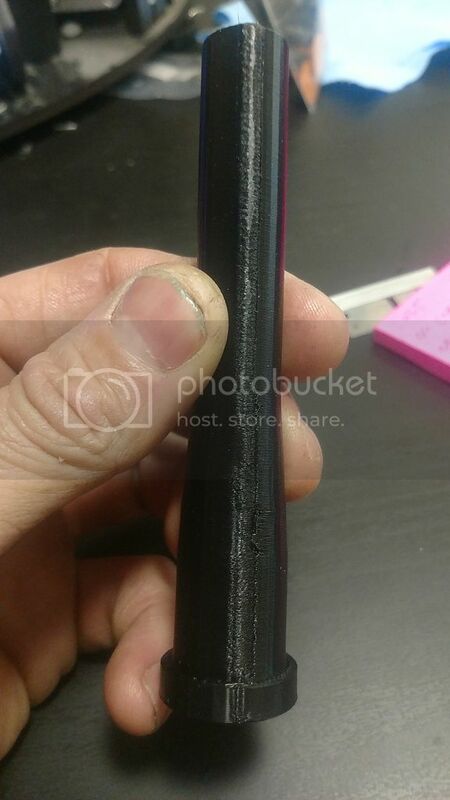 do you have a foto of the printed part, and the STL file? Without seeing your model, it's hard to say, but I think it's a geometry problem: the wall is too thin for the extrusion width. A 2 mm wall with a 0.4 thread width (which I'm assuming, as it's typical) has room for barely 4 threads. If the model has a gazillion facets around the circle, then the slicer can't fit the threads side-by-side through all the junctions and produces gaps. Reducing the thread width may help, because a slight reduction will suddenly fit "one more thread" into the available space. Some (versions of some) slicers can adjust the extrusion width to fill in the gaps, but getting it right requires experimentation. That's almost certainly too much retraction. Eliminate coast & extra-on-start, get the zits lined up, adjust the retraction until it's pretty good, then fine-tune with coast & extra. Although I don't use S3D and don't know its keywords, it has a setting to control the position of the layer steps. Pick "aligned" to put all the zits together or "nearest" to put them at the closest vertex. However, the model geometry affects the zit position, so experimentation will be your friend. 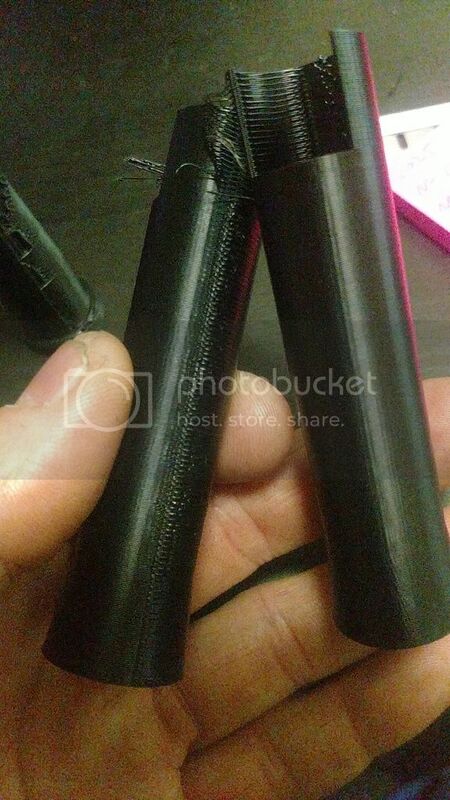 To avoid wasting filament, preview the G-Code at http://gcode.ws/ to make sure everything lines up the way you expect. I will get some pictures and figure out how to upload the stl file. I was thinking this morning maybe S3D is seeing the model differently than matterhackers slicer is or something. I'll get back to you guys when I get off. I have already tried most of your suggestions. Thanks, I will get more info later. Remember: it's not just "the slicer" but their myriad configuration settings: you can get completely different results from the same slicer with different settings. I have attached some pics and the two stl files. I am using a .035 nozzle with a .4 width at .2 layer height. I also tried .25 layer to get a faster print with a .42 with and a .45 layer. I skinnier of the two models (the one with the cut out in it) Is two walls thick and with the fill gaps I can get S3D to extrude in between those two walls. The other model I have tried same settings as above with 2 and 3 walls. 60mms to 30mms. 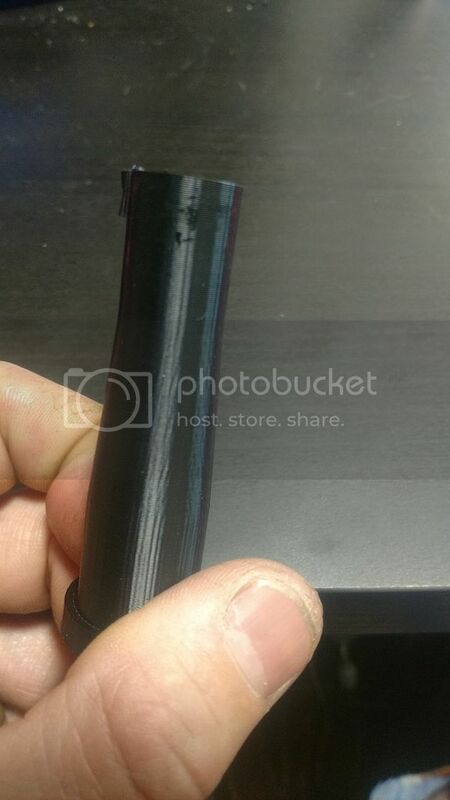 All in ABS, I can (tube insert) model to print better if I use PLA. 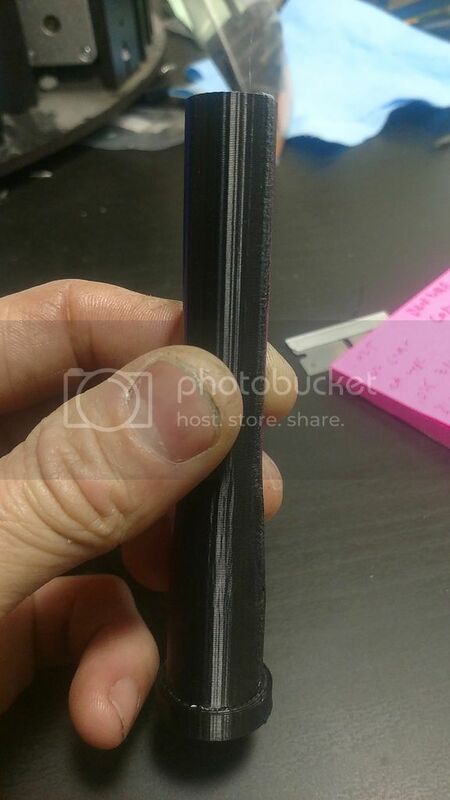 These were printed .25 layer .042 width, 3 walls, -.5 retract, 2mm wipe and I believe no coast. This was the best I could do. Same layers, and wall, no coast, 1mm wipe, 30mms, no retraction, 0 on restart, and I think I I may have printed two parts at one time. Can be sure, I have printed so many and my notes got a little mixed up. IC3D ABS and maker gear ABS 245C. The last two photos the part is not that bad but off of the rostock I only have a very small vertical line that is indented not raised. This is the best I got the other part to print. I printed two and then four at a time hoping to cool the part a little. "Eliminate coast & extra-on-start, get the zits lined up, adjust the retraction until it's pretty good, then fine-tune with coast & extra." I got the zits lined up, I will try the coast and extra as you stated. "Although I don't use S3D and don't know its keywords, it has a setting to control the position of the layer steps. Pick "aligned" to put all the zits together or "nearest" to put them at the closest vertex. However, the model geometry affects the zit position, so experimentation will be your friend. 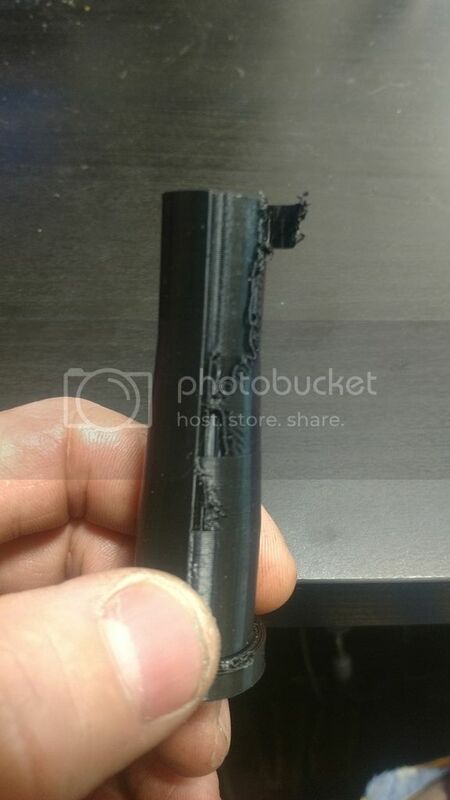 To avoid wasting filament, preview the G-Code at http://gcode.ws/ to make sure everything lines up the way you expect." Yes S3D will allow you to use random start points, which gives you the zits. Choose start points closest to a XY location. I do the last one. Also S3D will show you where your retracts and other positions will be, and will even show your coast and wipe lack of extrusion. Shows you the positive bump you will get as well. The ID prints everything else I have thrown at it just perfect! But these are the parts I really need it to print and I need them in ABS. Gonna do some more testing. Which means the assumptions made by the previewer don't match the physical reality, so your job is to reduce the discrepancy. I infer you have not actually calibrated the Extrusion Multiplier, which is the absolutely key variable in the whole collection of settings. Search the forums (with Google, et al, as the forum search is weak) for my previous impassioned rants. The slicer assumes the extruder squirts out exactly the amount of plastic required to fill the available space. 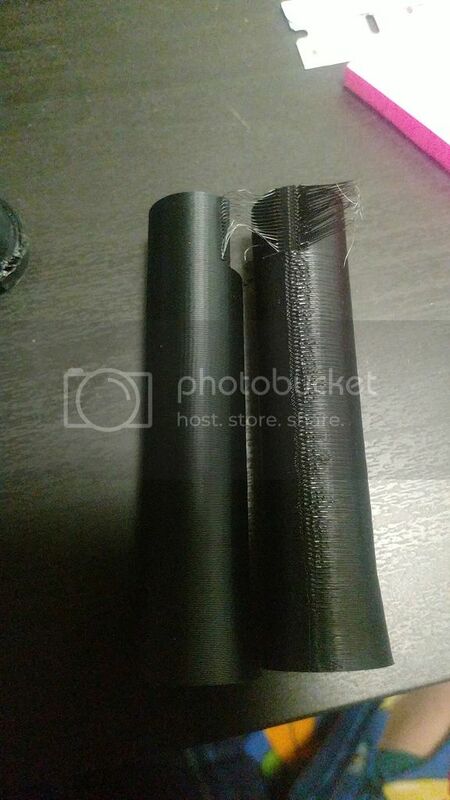 The plastic volume depends on both the actual, measured filament diameter and the Extrusion Multiplier. Reset all the retract / coast / whatever numbers to their original default values, measure the filament diameter, calibrate the Extrusion Multiplier, then see what happens. The detailed calibration process should be in the startup guide, but the general idea is to print a single-wall open box with an ideal thread width, measure the actual width, multiply the EM by the ideal / actual ratio, and iterate a few times. For example, if the slicer assumes the thread width will be 0.40 mm, but you measure 0.45, then the correct Extrusion Multiplier will be (close to) 1.0 x 0.40 / 0.45 = 0.89. Adjust the EM, print another thinwall box, measure it, and it should be just about spot on. Tweak as needed, iterate once or twice, then move on to re-tweak all the tedious retraction / coast / whatever settings. IIRC, S3D uses a single Extrusion Multiplier value for both extruders. If I remember wrong, which I hope is the case, then you can calibrate both extruders and get ideal results. If they share a common EM, then you must calibrate both and pick a compromise EM to produce equally wrong results. I need to do that. Oh the multiplier can be changed per extruder. E0 and E1 have their own independent settings tab. I will print some hollow boxes tonight and report on the findings. THANK YOU 10000000000000000000000000000000000000000 Times!!!!!! Drew up a 20x20 thinwall cube. printed 3 times and was spot on. My parts are one millon times better!!!! It is late so I will post the pics tomorrow. Thank you very much!!!! !